Do you own more than one home? Perhaps you have a vacation home in the Desert Southwest as well as a primary home in another place. Perhaps you downsized to a smaller home in a retirement community but maintain ownership of a home that you rent out to others. Customers and friends of Nielsen-McAnany Insurance Services, Inc. need specialized home insurance products for a variety of reasons. We understand that a one-size-fits-most policy simply won’t work for our customers, and we partner with a network of insurance providers in order to find customizable options to suit each individual that comes to us. If you own a single rental home, you need special protection without the extensive coverage and liability options carried by a large property management company. We work with many landlords who own one or two single-family homes, and we’ll help you get the protection you need for your property without the cost of unnecessary business coverage. A home can sit empty for a variety of reasons. Whether you are waiting for your home to sell, leave one or two homes empty while you travel each year, or have a rental home that is currently unoccupied, vacant home coverage can help you cover some of the risks specific to your situation. If you own or occupy a vacation home seasonally, you shouldn’t insure it the same way you insure your primary residence. Check with one of our knowledgeable insurance agents to learn more about seasonal home insurance options that can save you money and help you maintain peace of mind all year round. No home is exactly the same as any other, and no customer’s insurance needs are exactly the same as someone else’s. 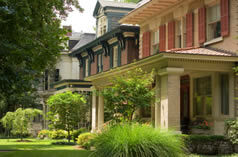 To learn more about seasonal home insurance and other specialized homeowners policies, contact us today. We’ll be happy to listen to your concerns and help you find the right home insurance solutions.